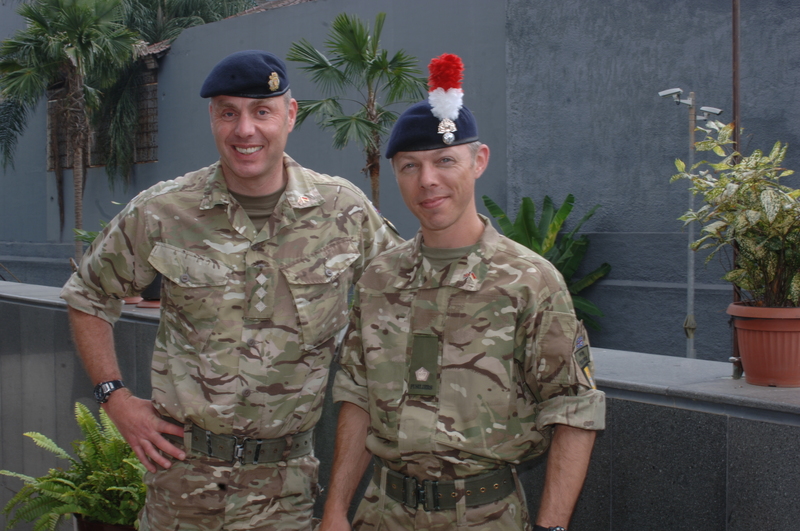 Major Paul Lodge and Captain Chris Willett are both reservist members of the Military Stabilisation Support Group (MSSG). In their civilian jobs, Paul is a Project Manager and Chris is a Police Officer. 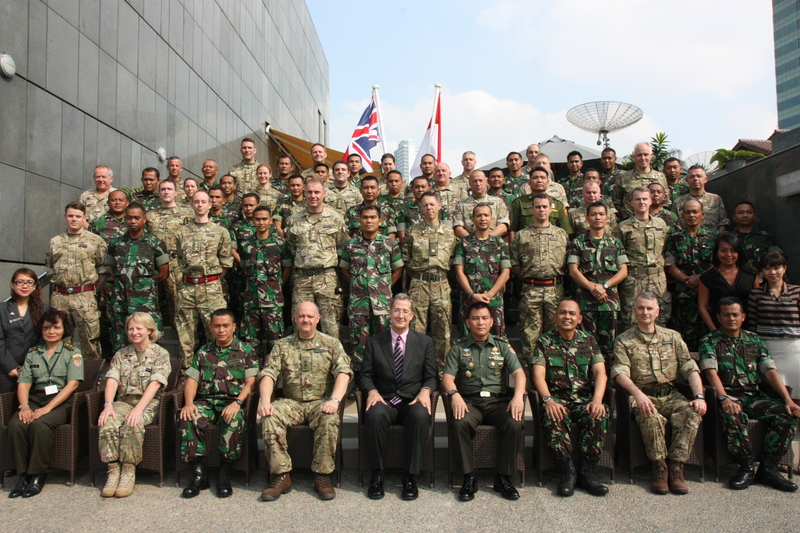 For two weeks, they are deployed on Exercise Civil Bridge, an MSSG overseas training exercise which this year is taking place in Jakarta – the first joint exercise of its kind to involve the British and Indonesian Army. Day two’s highlight was meeting with the Mayor of East Jakarta, who even laid on some cake for us. A piece of ‘sponge in a bag’ was going down well when the room went quiet and our hosts stared at one of my colleagues. The Mayor who knew no English managed to say ‘we don’t eat the chilli’ as a green wedge disappeared down with the cake. The gathered masses sat back to see the result as they all agreed, ‘no we never eat the chilli; it’s hotter than red ones…only to flavour the cake in the bag’. To spare any blushes I’ll say no more but it’s fair to say the ice was broken. We had a busy morning of meetings planned. After the interviews with Mayors we got out to meet more people. First up, the local police who, after the formal presentation, took us outside for a more relaxed demonstration of their inflatable rescue equipment. In front of about 100 officers and the station’s car park attendants I was in high demand for photo opportunities. That lasted until they realised WOII Chris Parsons is a stunt double for Michael Owen and I was side-lined as they clambered to have a photo with him instead……most undignified! It actually took some time to extract from the Police who kindly offered to visit us when we next have floods. They struggled to grasp that we don’t have a ‘rainy season’ or more accurately a ‘non- rainy’ season and that we have no idea when or where we will have floods!! They have a complex system of pumps and gates which to be blunt directs flood water to a low lying shanty town across the road from the station. The city evacuates the residents, the area gets wiped out and they efficiently clean up the mud salvaging enough wriggly tin to rebuild it. Have we considered doing that? Hmmm answers on a postcard as to where you would recommend we trial the concept. The partial construction of colossal high density housing projects suggests an effort to alleviate the problem of shanty towns but I suspect the current pace of economic development will draw people into the city to fill any space vacated by those already there. A five minute walk brought us to the local health department where we had another exceptionally warm welcome. Offered fruit instead of cake (naturally) we were frankly amazed at what they can deliver with so little. Accommodating 500 displaced locals in the foyer and another 400 in the basement (rooms, which aren’t big at all) …. for a month…with food, clean water and health care etc while not 50 metres away the flood waters wash away the neighbourhood and wash in rubbish and toxic waste from across the city. Of course the rats and other vermin have the same idea when their homes are flooded. Impressed? Just a bit! After all that hard work we needed a bit of local situational awareness and headed for the old town from where the Dutch ran the country as their colony in the late 18th century. Walking past a line of school children waiting to enter a museum caused carnage when they all decided they wanted a piece of ‘Michael Owen’ and followed us down the street. What must their teachers have thought? We are now into Day 3 of the main part of Exercise Civil Bridge (ExCB14A) and we’ve had a fascinating experience so far. 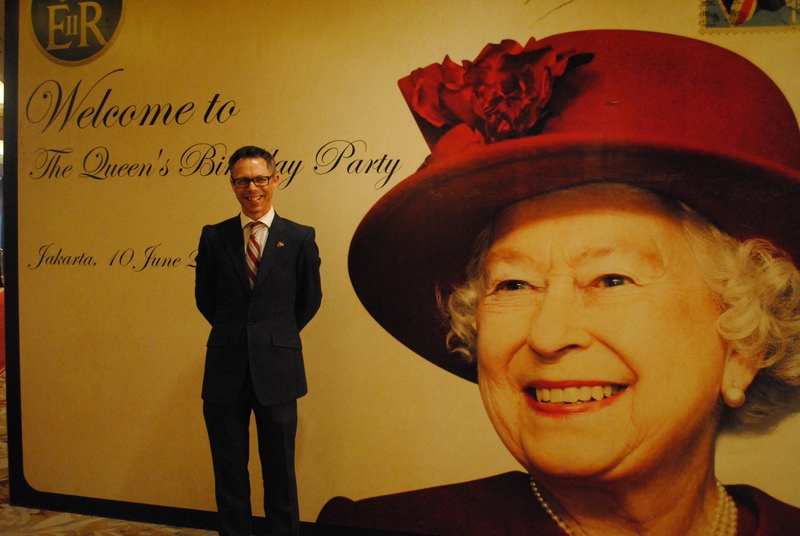 The training and flood preparedness assessment are going well and we were asked to support the Embassy Defence team at the annual British Embassy Queen’s Birthday Party last night. The teams that have been deploying on the ground have been making excellent progress with getting a first-hand look at the ways in which Jakarta is prepared for future floods. This has involved the joint MSSG/Indonesian Army (TNI-AD) teams coordinating meetings with key players involved in managing the floods, visiting these people and seeing the infrastructure that is in place to either combat the flood water or mitigate its impact on lives and livelihoods. questions around lessons learned and future risks. The teams are conducting the interviews with a TNI-AD interpreter using this question set as a guide, while other team members record the responses directly onto the application via the tablets that have been issued to each sub-team. Images and video footage from the mobile devices – we are trialling both iOS and Android platforms – can be added directly to the text and then published to GeoDash. As soon as the survey is published, this information is made available to all members of the all-informed net and is location-tagged on our mapping. This allows the Ops Room, or any other member of the team, to interrogate specific points on the map and see what data has been collected there – rather like clicking on a restaurant review on Google Maps! As a result of our extensive use of this platform, we are working with the team at DSTL to suggest improvements and new ways of working with the kit. This will support the broader work of the MSSG and other teams within the Security Assistance Group (SAG). So far the teams have visited mayors’ offices, police stations, medical facilities and flood defence infrastructure (both existing and some under construction). Here the local Mayors have real responsibilities in terms of managing district finances and services, unlike the more ceremonial role that most mayors have back in the UK – and the police are one of the lead agencies in a flood. This is providing us with the overriding impression that flooding is simply a fact of life for most Jakartans and they are prepared and conditioned to deal with it. However, we are also finding areas where, with a little bit of investment, the response could be further improved. The time spent on the ground has been invaluable in building relationships between our team and our TNI-AD colleagues. We are relying on them to set up and facilitate the meetings to provide the interpreters. In turn, they are learning about the UK approach to Humanitarian Assistance & Disaster Recovery (HADR) and getting a good understanding of some of our technology by using the kit on the ground and in the Ops Room. In parallel with the assessment work in the field, we are also delivering the second of three comprehensive training packages in stabilisation and HADR. These have covered the full spectrum of our work from consent-winning activity, through use of interpreters to negotiation skills. This package has also been supported by some excellent guest speakers, including members of the British Council based here in Jakarta. The TNI-AD cohort have been hugely enthusiastic throughout the training and have been working out of hours to support their own colleagues with less English language capabilities. 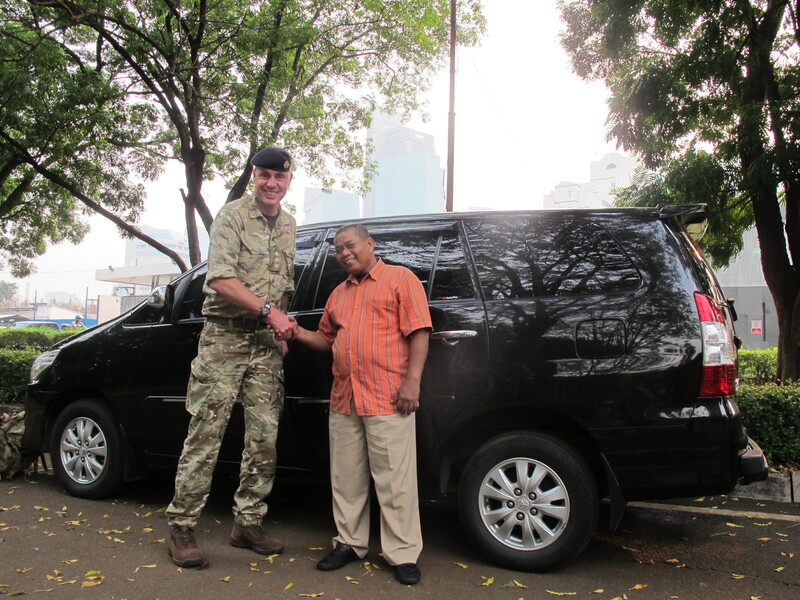 Outside our day-to-day work, we have been constantly exposed to the life of the city by the TNI-AD, members of the Embassy staff and the people that we have met on the ground. Everyone has been incredibly warm and friendly and it seems that wherever you go you are offered something new and interesting to eat, generally involving lively amounts of chilli. As part of this process we were asked by the Embassy team to help support British engagement in Indonesia by joining their staff team at the Queen’s Birthday Party last night. 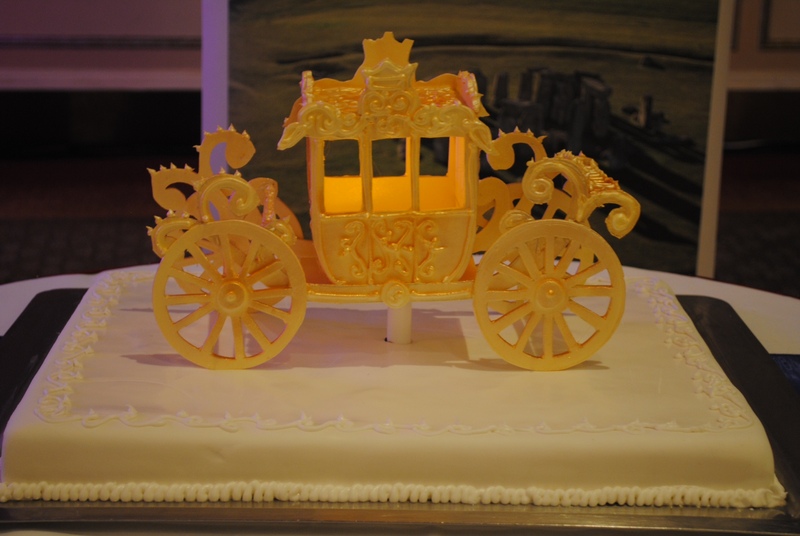 The Queen’s Birthday Party is one of the major events in the Embassy calendar and is an opportunity to promote UK trade and investment into the region. As a result, many well-known British brands were represented, and all Embassy staff were expected to be on hand to support and promote the close working relationship between the UK and Indonesia. It was an excellent opportunity for us, as team, to network within the disaster management community in Jakarta. For instance, we were able to meet with a small Australian team who have a permanent Disaster Reduction team in Indonesia, the Australian–Indonesia Facility for Disaster Reduction (AIFDR). 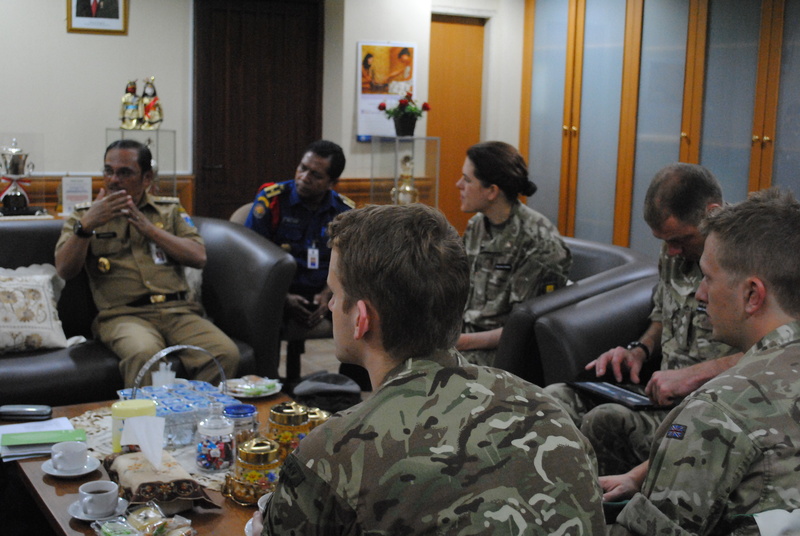 We were also able to meet with other members of the Indonesian military and police, who provided us with advice and guidance on how we could gather additional information to support our work here. Looking ahead to the next couple of days, we will be continuing to conduct our data collection activities and, hopefully, be able to continue developing our cultural understanding of the area, including a visit to the nearby Commonwealth War Cemetery. We will be posting regularly throughout the exercise and will look to give you a flavour of all of the elements of our work via this blog. For those who may not be entirely familiar with our organisation, the MSSG is small group nested in Force Troops Command (FTC) as part of the Security Assistance Group (SAG). Our role is to provide military support to Stabilisation and Humanitarian Assistance & Disaster Recovery (HADR) operations. We are a hybrid organisation bringing together Regular and Reservist personnel from all three Services. This broad mix of skills and experience has enabled us to deploy to Indonesia with an incredible depth of capability including world renowned academics, military and civilian practitioners and up-to-date operational experience. Arriving at 1am is never the best way to see a city and as we headed out of our hotel for the British Embassy on the first morning I was looking forward to soaking up all the visual riches Jakarta had to offer. Sadly, for a tortuous mile our car inched along in a sea of mopeds and my view was of suburban garden walls and palm trees. At the Embassy (an oasis of aircon and real tea) we met our Indonesian Army Liaison Officers (LOs) and mingled with mixed results. The range of English varied from the downright chatty to embarrassed shoulder shrugging but as the teams came together we realised we had landed a bunch of capable and affable counterparts and took our places for a welcome speech by the British Ambassador and the Indonesian Brigadier General. After a prep period during which our eager LOs pestered us and clearly thought we were faffing, we ’hit the ground’ not necessarily running, for the Jakarta traffic precludes travel faster than walking pace in a car and even slower if you are walking. Our enthusiastic efforts to establish a good working relationship with our driver didn’t go well either. Every time we asked his name he said “I’m sorry”, “No need to be sorry mate, just tell us your name”, reply “I’m sorry”. Two days of this and we fixed it…his name is Ahmsori! We were off to interview the Mayor of South Jakarta in his modern skyscraper. Setting up in a warm, dim anti room full of soft sofas, it wasn’t long before the combination of jet lag and the soporific voice of our host made me crash. I was fighting sleep like I was in an MMA cage with the Sandman- and he had a hammer! In the nick of time I was rescued by the Mayor’s staff delivering leaking bottles of water and the subsequent effort to stop the drips pooling in my crotch was enough to bring me back into the room. The meeting went well as his officials tag teamed to answer the question set we had designed a month ago in Larkhill-with amazingly credible results. I‘d really love to tell you about the journey back to the Embassy but we all slept soundly through it. An evening of writing up the interview (teething troubles with the tech we are trialing) and it was thankfully bedtime, a cool shower and clean linen never felt so good. By way of introduction, my name is Paul; I am a Major in 5RRF, currently posted to the Military Stabilisation & Support Group (MSSG); and my role is Exercise Chief of Staff (COS). I am an ex-Regular Army officer now working as a programme manager in UK Central Government and as an SO2 in the MSSG. So, why/how did we end up in Jakarta? Indonesia is a huge democratic country in South East Asia with a thriving economy. On that basis it wouldn’t seem like the obvious choice for an exercise in HADR and disaster management. However, it is, geologically, hugely unstable as it rests on what is known as the Pacific Ring of Fire. This is where three tectonic plates converge to create a region that is constantly at risk of earthquake, volcanic eruption and/or tidal waves. Much of the country also sits below Mean Sea Level and is, therefore, prone to regular flooding. In most cases, the Indonesian Army (TNI-AD) and the Indonesian National Board for Disaster Management (BNPD) are the first responders in these emergencies. As a result, both TNI-AD and BNPD are very keen to understand how other nations approach HADR in order to learn and they are keen to reciprocate by sharing their learning. Indonesia is also a major trading partner with the UK, therefore, the British Government is keen to strengthen relationships with Indonesia on all levels. 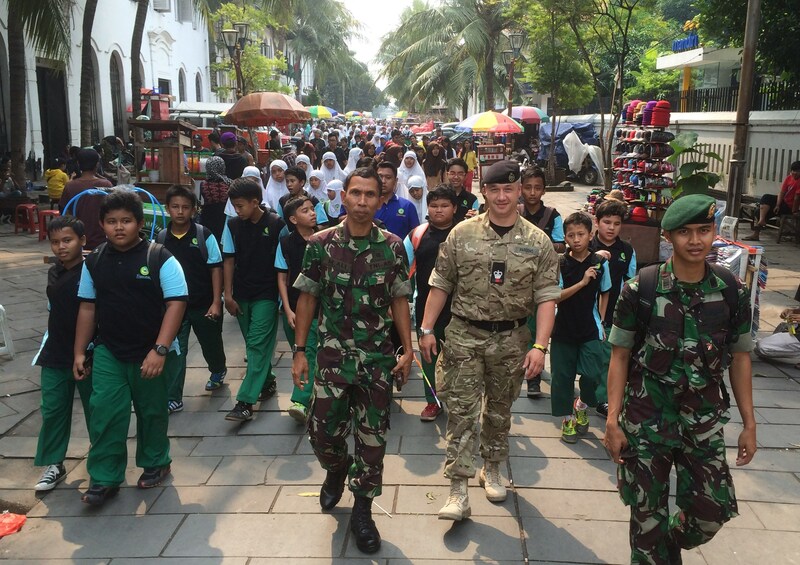 Exercise Civil Bridge (ExCB14A) is the British Army’s first joint exercise with the Indonesian Army. 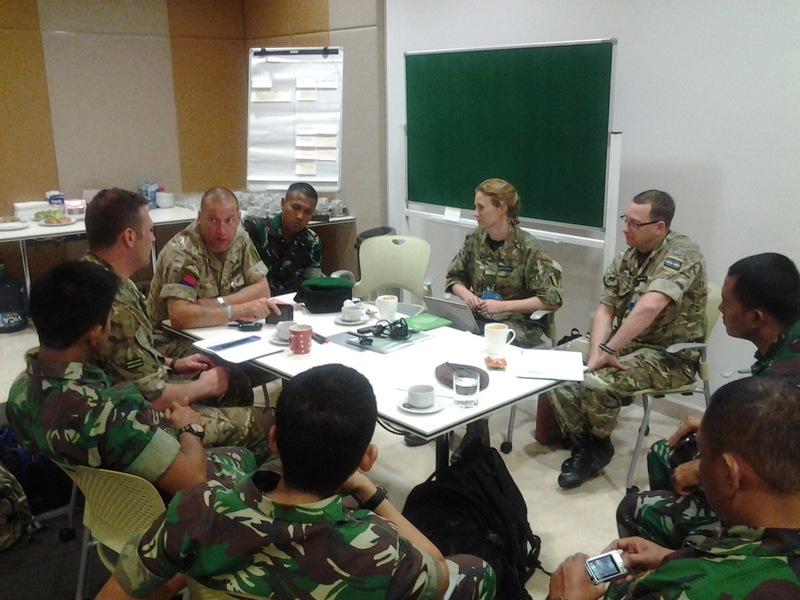 It is intended to provide the Indonesians with the current British Military view of Humanitarian Assistance & Disaster Recovery (HADR) operations in the form of a comprehensive training programme and to allow an assessment of the Flood Response Plans for Central Jakarta in order to share knowledge on our response to flooding. We had been warned off that we would be deploying to Indonesia towards the end of 2013, and as our planning shaped up a team of 30 personnel was identified, primarily from the MSSG but also including members from the DCSU, 15POG, 52MI, HQ BGN and 42 Engr Regt (Geographic). In terms of the civilian skillset we have civil engineers, police officers, health professionals, cultural specialists, local government infrastructure specialists, and a range of other trades. This mix has ensured that we have the necessary skills and experience to provide and deliver a well-researched and credible product to the Indonesians. Since then we have had a small team (mainly of one!) working to set the conditions for a successful deployment. The pre-deployment phase has included two full weekends of preparation in order that the Regular and Reservist team members had the opportunity to start forming in their teams. During this period we studied the existing flood plans in detail in order to understand how the response should work in theory and to identify who had responsibility for what at the District, Sub-District and Village level in Central Jakarta. This allowed us to develop our plan of who we would need to meet with and what facilities we would need to see in order to understand how well the plan would be translated into action on the ground in the event of a major incident. This information was then passed on to the Embassy Defence Section who worked to facilitate the organisation of the meetings with TNI-AD assistance ahead of our arrival. 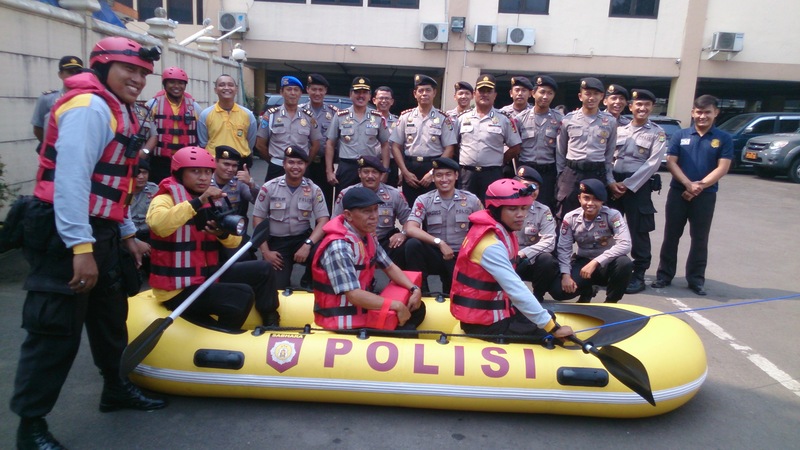 An Advance Party deployed to Indonesia on 31 May 14 and established a small presence in the British Embassy in Jakarta in order to begin the training delivery and to conduct a study period on the disaster responses to the Yokyakarta earthquake and tsunami (2006), the Merapi volcano eruption (2010) and Jakarta flooding (this occurs multiple times each year). Both the training and the study period generated some keen input from the Indonesian team and resulted in some very positive feedback. The rest of us were very keen to get on the ground to begin the process of meeting the TNI-AD personnel we would be working with and to get on the ground. Our journey began at Gibraltar Barracks in Surrey, the current HQ for the MSSG, on Sat 07 Jun 14 when the bulk of the team gathered for the journey to Jakarta. Two of the team were travelling separately from their work locations in India and Nepal. After some additional kit issue (followed by frantic weighing of bags in order to avoid a £125 excess baggage charge if we broke the 30kgs limit) and an update briefing we were on our way to Heathrow for a 2215 flight to Dubai and then on from Dubai to Jakarta. 19hrs later, at 2330 local time the following day, we arrived at Jakarta international airport after two long, but uneventful flights and were greeted to enormous queues for passports. An hour later and we were waiting for our luggage and finally on the last leg of the journey by coach to the accommodation. We had been warned that traffic jams were a fact of life in Indonesia but I had thought that at 0030 on a Monday morning we might have a clear run, however, this was not the case and the three lane motorway from airport to the city was solid traffic and seemingly without a Highway Code. Having negotiated the traffic we were greeted by the Advance Party and issued with our accommodation. We finally got our heads down at 0200 for an 0745 departure for work. 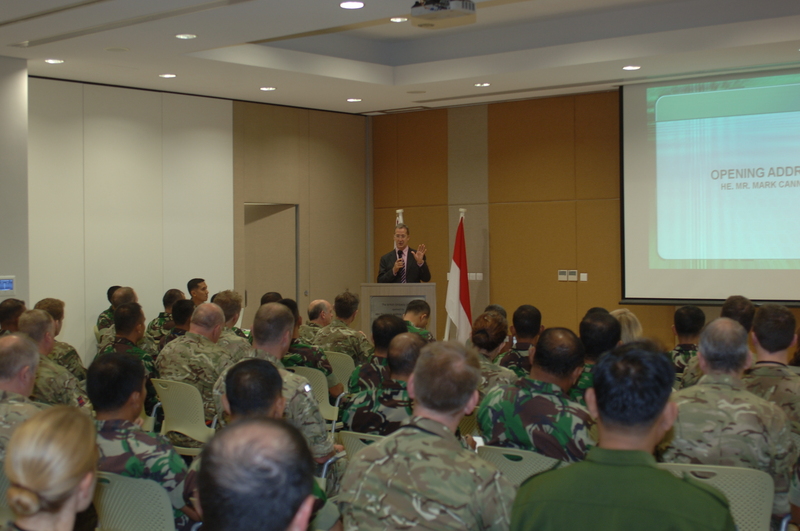 Later that morning we were all present at the British Embassy in Jakarta for a joint UK/TNI-AD welcome briefing by the British Ambassador, HE Mr Mark Canning CMG, and Brigadier General TNI George Elnadus Supit, the Deputy Assistant of Operations for the Indonesian Army. This set the scene for the high level of cooperation and integration between our team and the 40 TNI-AD personnel that would be undergoing training and joining our teams conducting the assessments on the ground. Following the opening addresses the teams got to mingle and meet each other before deploying into the city for the first round of meetings. Our plan for Day 1 was to conduct initial meetings in South/Central Jakarta with key personalities responsible for managing the flood responses at District, Sub-District and Village level. These meetings had been pre-arranged by the TNI-AD personnel and occupied the majority of the day with travelling time (i.e. Jakarta traffic time) factored in. The reason we have a dedicated IT rep in the team is because we are using a new suite of tools from the Defence Science and Technology Laboratory (DSTL) that allows us to operate effectively when undertaking HADR operations. We have used this on previous exercises in Kenya and it enables teams on the ground to post reports with imagery in realtime on a Google maps based interface. Alongside an instant messaging application this allows the Ops Room to see the locations of all the teams plus the imagery and data that they are collecting. The teams on the ground can access the platforms via tablets (or any other mobile device) that connect via the local 3G network or by WiFi. The use of the tool in a predominantly urban environment for the first time will allow us to further refine and develop it for future use.